*We offer a subscription service. Just tell us what comics you want and we will reserve each new issue for you as soon as it comes out. Let us make some suggestions for that hard to shop for person. Even if we don't have it in stock, chances are we can get it. Where other stores failed, we are sure to succeed. Batman, Green Lantern, The Flash, Wonder Woman & Superman logos are properties licensed under DC Comics™. 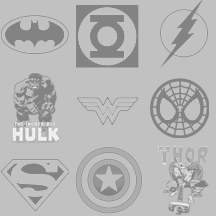 The Hulk, Spider-man, Captain America & Thor logos are properties licensed under Marvel Comics™.